Last November, my officemates and I got all geared up to attend Nidhi’s marriage in Jodhpur. The marriage was a truly pompous traditional affair. Rajasthani hospitality at its best- great food…spicy to the last ‘y’, great music and lots of vibrant colors. 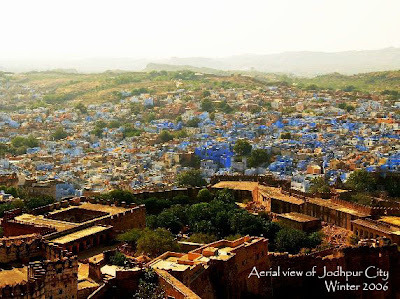 A rush through the forts and palaces of Jodhpur was another highlight of the trip. 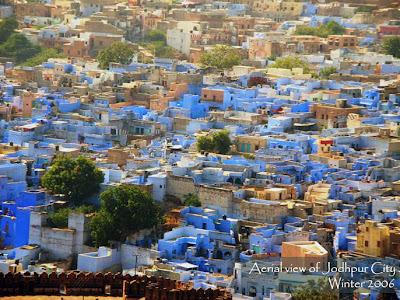 The view of the ‘Blue city’ from the top of the Mehrangarh Fort is indeed a treat to one’s eyes. Quite contrary to what I had expected, Jodhpur turned out to be a colorful place where the ‘old’ and the ‘new’ coexist quite well, of course with the former getting the roses it rightly deserves. Our impromptu tour started with the royal Umaid Bhavan Palace perched on a low hill away from the old city. The well laid out palace was designed by H.V. Lanchester in 1929 in an Indianised version of Art-Deco style. The palace when it threw open its doors for the first time in 1944, was the world’s largest private residence. The palace now houses a Museum(the only truly public space in the whole complex), a five star Heritage Hotel (of course public but for the ones who wouldn’t mind burning a hole in their pockets) and the private residence of the present King. I was impressed to see the carved motifs and the embellishments. 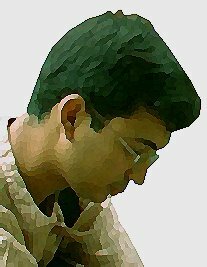 Distinctly European yet have an Indian touch to them. The next stop-over was at the majestic Mehrangarh Fort. Built on top of a rocky cliff, this fort is actually what legends are of made of. Built in the fifteen century, by Rao Jodha, it has truly stood the test of time. It now houses a series of museums. The whole complex is well preserved, probably the fact that it is still with the royal family explains the reason for this. The fort had all the colours and textures one could imagine hidden behind its impregnable walls. But the show stealer was the spectacular view of the city from its ramparts. The effortless transition of courtyards to rooms , the maze of stairwells to connect to the different levels, the discreet division of public and private realms, the ethereal quality of the streaming day light through the stained glass windows into the rooms, the carefully framed views of the city below (or probably they were just accidental) , intricately carved rajasthani jaalis all added to the richness of the experience there. As I bid farewell to the city, there was just one last wish in my mind. Knowing very well that some wishes are fated to remain unfulfilled, I did so in vain….. to be reborn as a medieval traveler lucky enough to have a glimpse of this city when it would have been at its zenith of glory. have heard of the city a lot. now, the desire to pay a visit some day has increased multifold! the fort..seems to grow from the rocks it sits upon.. It is really a beautiful city..a must visit. Thanks Nanditha for dropping by. Wow.. beautiful photographs, I can really relate to your wish of being reborn as a traveler..and travel through this country of ours..Incredible India.. indeed! !